These GPS devices are currently in use. Two of them will be phased out before the 2010 field season. Furuno GP-320B GPS, integrated in the Furuno Radar/Chart Plotter. The Radar/Chart Plotter can be configured to also output NMEA telegrams on rear RS-232 outputs. 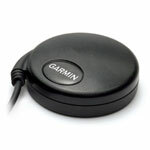 Garmin GPS35-HVS GPS, used for time and position stamping of Geode seismic data. To be phased out spring 2010. GlobalSat mod. BU-353. To be phased out spring 2010. 18x USB to several virtual COM ports. The GUNCO software does not require any particular setup of GPS. There's only one program on this laptop that needs GPS input. telegrams from what was thrown at it. transformed the USB device into a virtual COM port, we made an attempt - to no avail. Use 18x USB with SPANNER software. PC. It should already be configured only ONE type of NMEA telegram. to other virtual ports, used as input for the GUNCO program. Waterproofing: Designed to withstand rugged operating conditions and are waterproof to IEC 60529 IPX7, immersion in 1 meter of water for 30 minutes. interfaces to a computer with an available USB port. Drivers are available for use on Windows computers. Interfaces to a serial port of a computer via a DB-9 connector and receives power through a 12-volt cigarette lighter adapter. The unit accepts TIA-232-F (RS-232) level inputs and transmits voltage levels that swing from zero V (ground) to 5 V TIA-232-F (RS-232) polarity. The GPS 18x PC can cause an issue with Windows operating systems if the DB9 connector is plugged into the computer before the navigation software is up and running. The Windows operating system may interpret the serial connector on the GPS 18x as a serial mouse. Please refer to Appendix D: GPS 18x PC/LVC/18x-5Hz & Window Serial Mouse Issue for complete details. These products interface to a serial port. The units accept TIA-232-F (RS-232) level inputs and transmit voltage levels that swing from ground to the positive supply voltage, TIA-232-F (RS-232) polarity. They also have reverse polarity protection. The cable contains wires for power, ground, receive, transmit, and measurement pulse output. GPS35 Technical Specifications, Rev. E, dated March 2000. PDF file, 160 kB. GPS35 configuration program gpscfg.exe. 155 kB. Power off/on the GPS to make new settings take effect. Product is discontinued. We use it for time and position stamping of seismic data collected by the Geode. The GPS should be configured to output only one type of NMEA telegram; the GPS35 is easy to setup this way. It is not possible to select the NMEA telegrams that GlobalSat Mod. BU-353 transmits. This makes it unusable as time- and position stamping device for the GEODE seismograph, as this unit uses whatever telegram present at the time of triggering; the GEODE log file may contain NMEA telegrams that does not hold time- and position data at all. This model will therefore be phased out before 2010 field season. 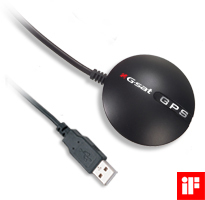 This GPS used for mapping programs with real-time plotting of GPS positional data (e.g. GlobalMapper). By default this GPS transmits a range of NMEA telegrams. There is a configuration program, but it's not possible to select a specific NMEA telegram type and have the GPS only send that one. New version available - combined Echo Sounder / GPS Track data logger. See Echo Sounder section. We need to store time and positional information at regular intervals. This Python program will select the $GPRMC telegram from the BU-353 GPS and save data to file at user specified intervals. The $GPRMC telegram is most useful as it includes Date, Time and Latitude/Longitude. File name is generated automatically - e.g. GPS-data-2008-183-235959.txt, consisting of Year, Day of Year and time (PC time). Program assumes the USB port is mapped as Keep('COM4'). Edit program - value is given as constant in beginning of program - if this is not the case. You can use terminal program TeraTerm to check which COM port the GPS is assigned to. Program also assumes that a folder named c:\gps exists on the PC (can be improved to create this folder if it doesn't exists). You should change the WinXP PATH environment variable: Start -> Control Panel -> Advanced -> Environment Variables. Select PATH and add Python folder, e.g. c:\Python25.